The Airbnb at our overnight stop in Spokane, WA, was advertised as having an incredible view, and it surely didn't disappoint. The elevated rail track even had a train on it at one point! So functional. The next morning - the final morning of our road trip!! - we ate at a small cafe in downtown Spokane, and I realised someone had stolen all my money. After I got off the phone with my bank and remembered paying rent was a thing I did, we set off into Washington. The home stretch. We were also surprised to be driving through crappy fields again. Flying into the Seattle-Tacoma airport, you'd think the whole landscape of Washington was breathtakingly mountainous, but we probably drove a few hours through agricultural country. I bet their potatoes have nothing on Idaho's. The trip begins to blur at this point. Thousands of miles of interstate roads will do that to you. point being, I don't remember too much of Washington vividly, but I do know what happened to Sergeant Bowe Bergdahl! We listened through the penultimate episode of Serial, but arrived at the Snoqualmie Falls before we could finish the whole podcast (we finished it on the plane, fear not). We were both pretty jazzed about the falls, because it was less than 30 minutes from there to Dad's apartment in Issaquah, WA. We used the opportunity of something worth seeing to stretch our legs, and feel some waterfall spray on our faces. 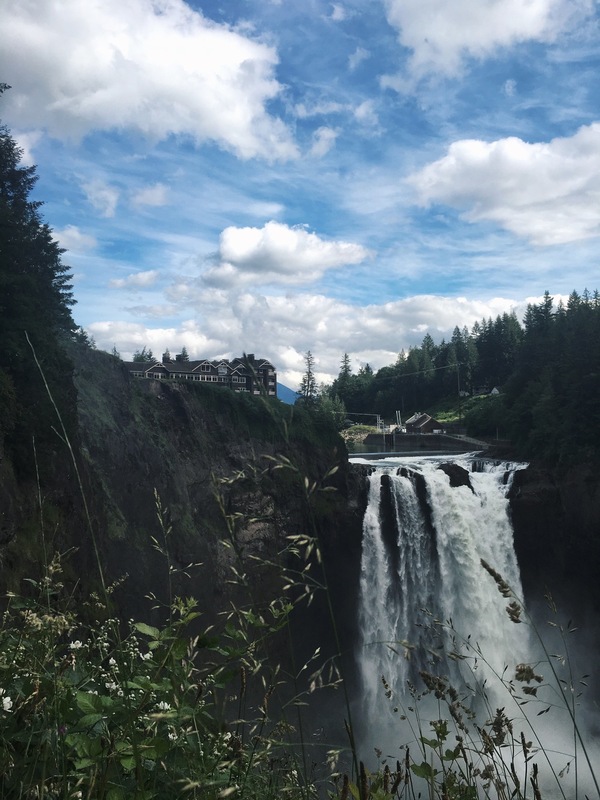 The 268ft Snoqualmie Falls, in all their glory. I took this at the top of the falls, on one of the upper viewpoints. Lia took a photo too! We also had the great idea of hiking down to the bottom of the falls, and became increasingly unsure of our decision the further down the steep trail we went. People dressed far more athletically than either of us were were quite puffed. But it felt good to use our butts for something other than sitting, for a change. And the view from the bottom of the waterfall. I took this, dreading the walk back up. We huffed and puffed our way back up the steep cliffside, and earned our seats in the car. Thankfully, this time they would only be for a little while. About 20 minutes later, we exited the freeway, and pulled into the neighbourhood that marked the end of our journey. Dad was out buying food at the time, so there was no fanfare arrival. The whole arrival felt pretty underwhelming though. I don't know if it was because we'd split the journey up decently, or if I was just repressing the memories of the hours and hours of driving due to PTSD, but as with most things in life, it didn't seem as huge as I'd been expecting it to be. Maybe because we couldn't run to the Pacific coast and splash about in the water as the sun set and a large soundtrack played us into the credits, or maybe it was because we were both so exhausted at that point all we really wanted to do was just rest for a while. Either way, it felt like it hadn't hit. And it still hasn't. I don't feel massively older, or significantly more cultured. I got some nice photos from the trip, and some wonderful memories that I hope Lia and I are still laughing about years from now. I ate at some spectacular places, and met some amazing people. By no means did I feel the trip was a poor time, I just expected to feel different. Or at least feel something. I suppose in the moment, you just feel a sense of relief that you can finally switch off for more than just a single night. We didn't have to worry about packing up and getting driving again early the next day. I think really we were both just so looking forward to getting back to Boston and rejoining our lives that we were mentally miles away, where it had all started. In some senses that makes me happy. From this trip I can say I've gained a new appreciation of how great Boston is as a city. I've also gained a bunch of beautiful photos I was able to take, and I will gain a cool tattoo to commemorate the trip. but I also gained a sense of context, and scope. America is a huge country. I don't say that purely in a geographical sense, although it is, of course. The sheer volume of other humans on this continent is so inconceivable to me, just one of them. But I have an idea of the unimaginable number now, and it makes complete sense that we can't agree on anything. The vastly different ways of life between just towns - let alone states - really hammered home to me why none of us can agree on anything. We're here in our liberal little city enclaves, arguing about things like which bathroom somebody can use. And more than anything, it's just irrelevant to most communities. It's just another world which so many Americans live in which too few of us appreciate. So there. A pseudo-deep ending to this series, where I realised that America is in fact a big place, filled with lots of people. Really something to chew on, right? But nevertheless, thank you for bothering to follow along and read this! Going forward, I promise to post about something a little more interesting than a blow by blow account of the time my wonderful, patient, supportive girlfriend and I drove across this big old chunk of land sticking out the ground. Jun 30 What do I talk about now?